Kickball is a 7-inning or 45-minute game played with 9 fielders (at least 3 female players and no more than 6 male players on the field). Each team must have a written batting order each week, and no more than 3 guys can kick in a row. Generally the game follows softball rules. The season lasts for 8 week with a 6 week regular season and 2 week playoffs. Playoff brackets will be determined by the final standings. Teams will play 1 game each week (rainouts and number of teams may force more than 1 game). During playoff weeks, teams may play multiple games in a given week. The Spring Thursday season will play at Union Terrace field and also Fountain Park field. Games will play on Thursdays starting at 6:30pm each week. The bar sponsor for the season is TBA. All teams must have at least 9 players. Teams must have at least 5 players (2 females) to be eligible to play each week. Referee fees are $10/team each game due directly to the referee at the start of the game. Teams may use a substitute player when needed during the season. All subs must sign the waiver before playing. Only substitute players that play during the season are eligible for playoffs. 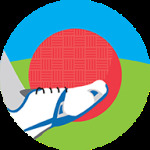 Check out this Kickball league '19SPR - KICKBALL - COED (RATIO (6:3) - UNION TERRACE/FOUNTAIN PARK (THURSDAYS)' with Lehigh Valley Leagues!